As part of the latest software update, the Thermo Scientific TruNarc handheld analyzer adds 45 substances, including carfentanil, to its onboard library. 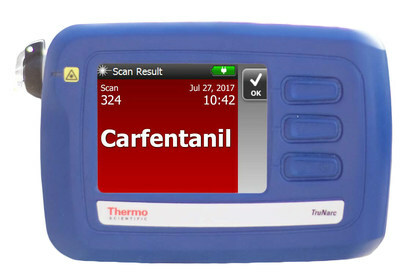 TEWKSBURY, Mass., Nov. 13, 2017 /PRNewswire/ -- Law enforcement agents, narcotics officers and customs personnel can now quickly and safely identify the synthetic opioid carfentanil and dozens of additional emerging drugs with the newest library update for the Thermo Scientific TruNarc handheld narcotics analyzer. Carfentanil, which is most often used to tranquilize elephants and other large animals, is a fentanyl analog that is 10,000 times more powerful than morphine and 100 times more powerful than fentanyl. As part of the software update, the TruNarc analyzer adds 45 new substances, including 14 new forms of fentanyl, to its onboard library. In addition to carfentanil, the TruNarc analyzer library now includes acrylfentanyl, the pharmaceutical variants alfentanil and sufentanil, and the fentanyl precursors ANPP and NPP, of which 50 kilograms were seized in Massachusetts in May 2017. That volume of NPP could be used to produce 19 million fentanyl pills. TruNarc, designed to allow users to quickly and accurately identify core drugs of abuse, painkillers and many emerging drug threats, added fentanyl, dibutylone, W-18 and U-47700 to its library as part of earlier updates. Carfentanil, a transdermal synthetic opioid, is one of the most potent opioids in the world and was the subject of a Drug Enforcement Administration warning in 2016. New Hampshire and Minnesota have experienced double-digit fatal overdoses of carfentanil in 2017. Carfentanil has been found mixed with heroin and fentanyl, and some forms of carfentanil can be accidentally inhaled or absorbed through the skin, placing first responders at serious risk. "The fentanyl epidemic has been described as 'stunning' by drug enforcement authorities, and carfentanil is emerging as an even more dangerous public safety concern," said Julie Planchet, vice president/general manager, field and safety instruments for Thermo Fisher. "The TruNarc analyzer's latest library update is designed to equip field agents with updated capabilities to stay ahead of emerging narcotics threats and protect the lives of officers and the public." The TruNarc analyzer, which debuted in 2012, is designed to reduce the need for law enforcement personnel to be exposed to unknown substances in many cases, designed, therefore, to make it safer and easier to test in the field. Using Raman spectroscopy, a well-established analytical technique, TruNarc is also designed to allow officers to scan a single sample for multiple narcotics in one non-destructive and non-contact test, and receive the results within seconds. An increasing number of law enforcement departments are deploying TruNarc to help limit the need to carry multiple chemical tests and reduce drug testing backlogs. For more information on the Thermo Scientific TruNarc handheld narcotics analyzer, please visit www.thermofisher.com/trunarc. Thermo Fisher Scientific Inc. is the world leader in serving science, with revenues of more than $20 billion and approximately 65,000 employees globally. Our mission is to enable our customers to make the world healthier, cleaner and safer. We help our customers accelerate life sciences research, solve complex analytical challenges, improve patient diagnostics, deliver medicines to market and increase laboratory productivity. Through our premier brands – Thermo Scientific, Applied Biosystems, Invitrogen, Fisher Scientific and Unity Lab Services – we offer an unmatched combination of innovative technologies, purchasing convenience and comprehensive services. For more information, please visit www.thermofisher.com.